It is amazing to this day that I am as involved in angling as I am, especially as none of my family have ever showed any interest in fishing. Yet I was always drawn to the water and what lies beneath the surface. I cannot pass so much as a garden pond without wanting to know what swims in it. 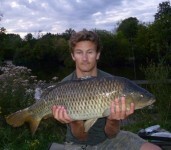 As a boy I was happy to catch anything that swam but by the age of 13 my primary quarry was Carp. I just couldn’t get over these large mysterious beasts that I saw suspended mid water in the beautiful reed lined lake that was a short bike ride from my family home. I used to sit up the trees for hours watching the large shadows glide through the water and was determined to catch one of these magical creatures. 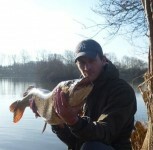 Unfortunately for me the lake was a tough water even for the experienced anglers who had been fishing for many years. It would be three years of regular fishing until I eventually hooked one of these beautiful old Carp. At 20lbs 4 oz I was over the moon and it was the end of a very frustrating time that nearly broke me. I was still at this point fishing a rod for Carp and a float rod so I was catching the odd Tench, Perch and even Trout. In many respects I started my fishing the wrong way round however, there were only a handful of people that had permission to fish this lake and most were like me, coarse fisherman or leisure anglers. This lake for me evoked a similar passion in me as Redmire has for so many anglers before me. Private, relatively unknown and just wild in every way. My real Carp fishing baptism of fire began when I got a ticket at Broadlands in 1995. 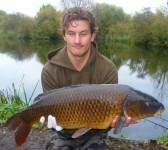 Broadlands is a historic Carp fishing venue that is now most well known for the BCAC competition. When I first arrived at the lake the new revolution of solid PVA bags fished right up against the many islands was taking hold. It was a really exciting time in Carp fishing and I was just in love with the place. The fact that there were 20 and even 30lb Carp present made it even more like heaven for a young and uber enthusiastic angler with a lot to learn. At the time a 20lb Carp was a very good fish and a 30lb Carp was the equivalent of a 40lb fish today. Most of my early catches were as a result of either luck or copying the successful anglers as closely as I could. 18 years on and the magazines, video and general Carp media onslaught teaches us to do exactly that. Much can be learned from other anglers and the fact remains if you are doing the simple things right and you are on the fish you will catch nine times out of ten. Bait can have a major impact on our catch rates but if you are feeding the fish what they want and they are hungry I believe most of today’s bait products will get you bites. A lot of the top anglers tell us to be different and do things differently and while this is good advice I have seen many people try and be ‘different’ only to blank with egg on their face. Good angling in my opinion is knowing when to be different and knowing when to employ and follow the winning method. Being different for the sake of it does not teach us much, if everyone is using yellow pop ups and catching then using pink may not help, if the yellow isn’t doing the business then look at what needs changing. My eyes have truly been opened since returning to fishing and I will never forget one of my first sessions back Carp fishing after a near five year break. I was amazed to see an angler next to me attaching a single fluorescent plastic corn on the hair. I had a giggle to myself only to be left well and truly eating my proverbial hat when he had 12 fish in the place of three hours. Other than this rigs have been another major evolution with some of them down right ridiculous in my mind. The rigs I have used previously have been tweaked slightly however they are much the same; the chod rig and the brilliant 360 rig are the only ‘modern’ rigs in my new armoury. The knotless knot and hair are the most important things to have ever happened in Carp fishing and no other method has made such a difference to the original pioneers catch rates, which are responsible for the growth of this sport. Back then of course it was a very niche sport and people made their own tackle and modified what was available. We have so many options now and the choice is sometimes overwhelming. I have three sets of specialised rods for different types of fishing including some 2.75 TC Greys Prodigy SX, some 3 TC Prodigy SX and a set of custom made rods for long distance solid bag fishing. My 13 year old self could never have hoped to have the gear that I do now, but does it make me a better angler? I’m not sure is the answer, it certainly helps in being able to fish at any range and be able to fish against snags so yes it probably does help me land a few Carp extra but all the gear certainly doesn’t mean I’m a better angler. The approach and preparation is what it’s all about, the irony is once you’re prepared and you have ideas about what methods you want to use you must almost approach the water with no pre determined ideas and locating fish is the best thing any angler can do. Only then will you really know if your approach is the right one and if it isn’t what you need to change. I have sat watching a group of 30 lb plus fish clean out every bit of bait around my rig and then casually swim off like they knew they’d just done me! What I learnt here is that fishing on the ‘hard, clear’ spot isn’t always the answer. As soon as I pulled everything back so it was on the corner of the clear spot in the thinner weed those fish. What I have noticed since my return to our beloved sport is what an epic business it is now, running a relatively successful company I understand that the sport could never offer the number of venues or options it does without there being a revenue generating business or two behind it. I for one get very excited about the huge amount of products out there and the ever growing number of businesses that make our life easier out on the bank. In many respects there is too much choice but as long as we anglers remember the reason we are fishing we can make the best use of the huge number of choices we have and I believe put more Carp on the bank if we don’t get too carried away. I must admit at one point I was so overwhelmed by all the magazines /videos and articles I decided it would be an interesting exercise to have a session with an angling coach. What a good investment it turned out to be! Ian Gemson proved to be a great guy and a brilliant coach. I have always considered myself a capable angler and what Ian confirmed is that I wasn’t going too far wrong I just needed to put a bit more detail and thought into a few small areas and off I was with renewed vigour and I’m certain the session helped put a good few more fish on the bank. Simple techniques that not only saved time but ensured that my rig would always be presented well and the best bit about it was it was all very logical. 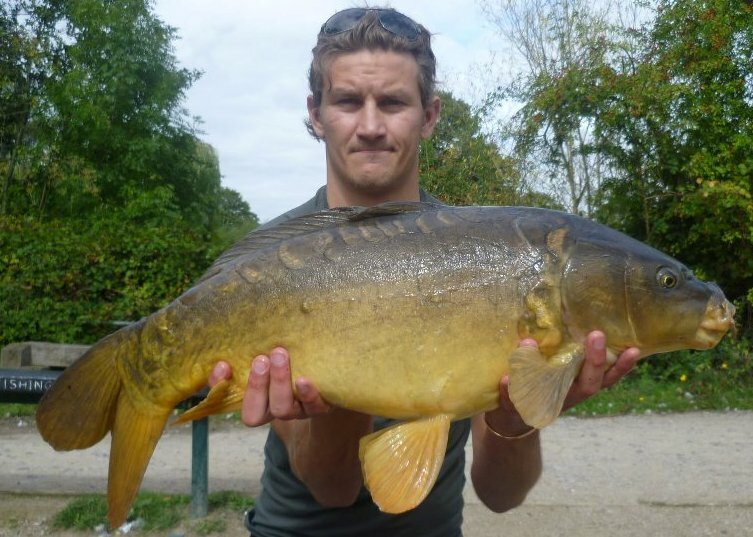 I have always held the view that Carp are not of enormous intelligence, yes they can get rig shy and yes they must through repeated capture know they are being angled for, but essentially if they are feeding you can catch them. None of this means that we need to come up with a new wonder rig every other week in order to be successful. Fishing is about doing the basics as well as possible and adding detail and thought to the areas that need thought ie line lay, rig concealment, accuracy and so on. The extra minutes or hours we spend making sure our rigs are going to sink properly and lay on the bottom or searching for the fish will be the difference between catching one lucky fish every other session to maybe landing three or four in a session dependant on venue of course. Venue is a crucial part of fishing and this leads me to a very new and exciting time in both my business and angling life. I am part of the group that has just acquired Farlows Lake in Iver, Buckinghamshire. This is every anglers dream – a lake which they can call their own, well in this case I cant call it all mine as I shall be sharing the banks with numerous anglers. Unfortunately I am not a billionaire so cannot own a lake for charities sake and it must at least go some way towards making some money in due course. I do see it as a long term situation and something that will respond really well to a substantial investment and the right kind of management. I won’t be running the lake myself however I will be overseeing all that is done while no doubt having a cheeky rod out or two! Getting a venue right for all anglers is near on an impossible feat these days as so many anglers require different results from their fishing for example the Yateley crew are not likely to want to visit day tickets with any kind of regularity yet an angler like myself who has limited time in which to try and catch a few fish will visit day ticket waters with the mindset of catching at least a fish or 2 in a 24 hour session. The lake is a wonderful place to be for those who, like me, love features. There are bays, islands galore, coves, bars, troughs, snaggy areas and just about every kind of feature where a few scaley beasts could be sat in waiting. The fishing is challenging at times but any angler of an average ability can go and take multiple catches in 24 hours if the basics are done well. Needless to say I couldn’t be more excited about the challenge of taking this fishery to the next level where it is run professionally and like a well oiled machine, allowing us anglers to get out and enjoy hassle free fishing in comfort. I am loving the steep learning curve I am on in terms of the fishing itself and I know that this lake will throw up a few surprises yet. Like many lakes locating fish is key and only a few days ago I was watching the water having not had a beep all day when no fewer than five fish showed themselves in the space of 15 minutes. Not bad for the end of February I thought and I needed no more persuading. The gear went back in the van and I was on the other side of the lake in minutes. Small pink pop ups attached and three rods cast no more than 40 or 50 yards to where the fish had shown. Within five minutes the left hand rod had a few beeps and I was hovering over it like a debt collector. Further beeps and I was not taking any chances, I lifted into the culprit and battle ensued. An uneventful initial fight followed a spirited margin fight. Once in the net I saw a nice plump common still in winter colours. At just over 18lbs I was not breaking any records but fishing has always been about catching regardless of size for me. Unfortunately I had to return home after this I am sure if I had been able to stay I would have had a busy night. Certainly the angler who moved in after me had fish to just over 30 lbs. Did I feel bitter? Not one bit I love it when people are catching as that’s what keeps us going back. For some it’s just being there, for others it’s the challenge of landing a new PB and for all of us it’s the never knowing what the next session may bring. This entry was posted in Profiles and Angling Stories and tagged carp fishing, ed mcdermott, the session. Bookmark the permalink. Well written – a good piece.